Home / News / How to get volunteers to show up to their shifts! How to get volunteers to show up to their shifts! You may think that asking a volunteer to pay for a ticket is just not right – how can you ask someone that is electing to give you their time to assist your event on their own merit to put money up for a ticket? Many volunteers are on a tight budget – isn’t that one reason they volunteer? These may be valid points, and of course we know that folks volunteer in exchange for their pass to the event as a way of saving money on the price of a ticket…. but when they don’t show up for their shift they are taking money straight out of the event’s pocket, both the time it took to onboard and schedule them AND the value of their ticket entry. And for those volunteers that show up again and again to save the day, it doesn’t do well to see others shirking their duties – high flake rates affect the overall performance of the entire volunteer team! A tried and true method of preventing flakes and protecting the event’s resources and revenue, not to mention the preserving the integrity of the volunteer program itself, is to charge volunteers in advance for the ticket, and REFUND the value to them AFTER they complete their work shifts. Alls fair in this game, and although volunteers may balk at having to put up the funds, since they get them back once the event is over, it’s super easy to just slap ’em on a credit card (Mom, can I borrow your credit card??). Charging Reimbursable Tickets keeps the team honest, and ensures departments are receiving the workers they were promised. 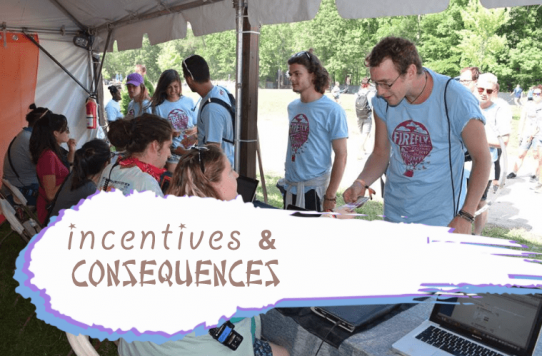 Charging an application fee may not be as good of a preventative tool as selling Reimbursable Tickets, however it does help to dissuade those applicants that aren’t committed to either completing the sign up process or showing up onsite at the event. Helping to weed out those folks cuts down on admin time spent reviewing applications, communicating, and scheduling noncommittal workers. So, end of day, charging an application fee cuts down on the total number of shift flake outs, come event time. First off, ensure that volunteers have all of the appropriate information they need PRIOR TO APPLYING. They should know when they are expected to arrive for shifts, lodging/parking details (if any), work expectations, total number of shifts/hours required, and shift times that may be required. Having all of this information up front will prevent folks from applying and later finding out they can not abide by a condition released by the event. Of course this helps the overall late cancellation rate, and it also builds a team that is confident in the program, and thus feel more obligated to complete work shifts. Participants generally want to lend their skills to the team, and they want to be recognized for their efforts and contribution (don’t you?!). When participants feel their time is not appreciated, or their skills are going unused, they are more likely to say “Screw it, I’m being underutilized anyway.” We all know that volunteering can feel like a lot of time wasted, so it’s important to combat this by giving volunteers feedback after their shifts; letting them know that someone actually knows what they did and appreciates it. This can be as small as a ‘Thank you – you did great’ at clock out, to earning a Star or Clout for completing a shift to delight of their department head. A little recognition goes a long way!